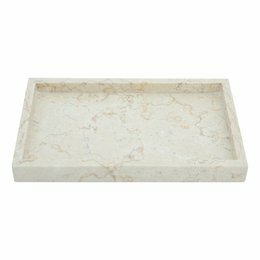 A Cream marble tray from our Vania set is suitable for many different applications due to its large size. Length x Width x Height 34 x 23 x 3 cm. 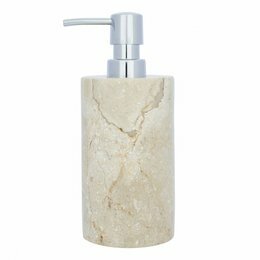 Soap dispenser made of a single piece of cream marble. This rectangular soap dispenser is a nice replacement for your plastic bottle. L x W x H is 8 x 8 x 19cm. 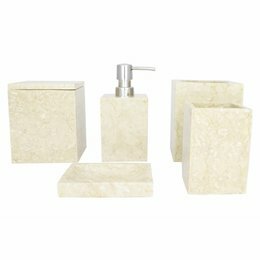 This luxurious 4-piece bathroom accessory set Bali from Marble contains a soap dispenser, 2-piece soap dish, toothbrush holder and a tray. 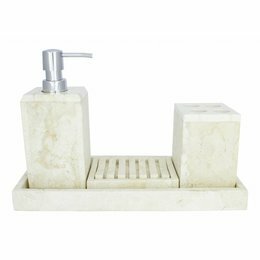 This 5-piece bathroom accessory set Madiun consists of a Tray, Soap Dispenser, Toothbrush Cup, Toothbrush Holder and a Jewellery Box. 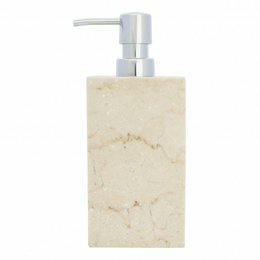 With this beautiful soap dispenser made of cream marble in your bathroom, kitchen or toilet you give your home what it deserves. The height 19 cm and Ø 8 cm. 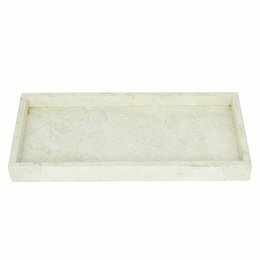 With one of our beautiful trays made of cream marble you always have a nice and permanent place to set up your bathroom accessories. Dim. 30x18x3cm. 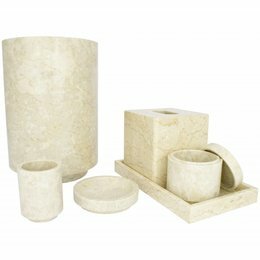 This 6-piece bathroom accessory set Banda consists of a Tray, Trash Can, Toothbrush Cup, Tissue box, Soap dish and a Jewellery box. 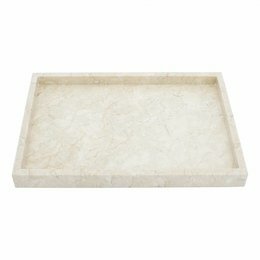 This tray made of marble comes from our bathroom accessory set Bali but can also be used for countless other things. 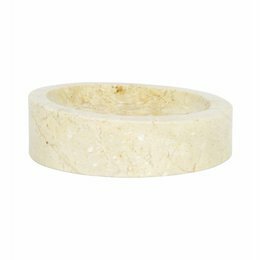 Soap dish consisting of 2 parts made of marble with the rough natural look and soft feel because of the sandblasted surface. 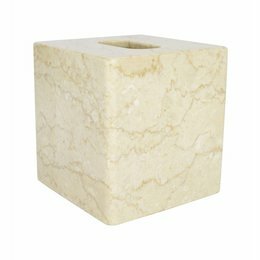 With this smooth polished tissue box of cream marble in the bathroom you will never have to look at a paper tissue box again. Dim. is 14x14x15cm. 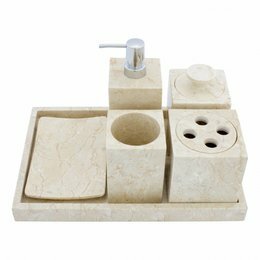 This 6-piece bathroom accessory set Vania consists of a Tray, Soap Dispenser, Toothbrush Cup, Toothbrush Holder, Soap Dish and a Jewellery Box. 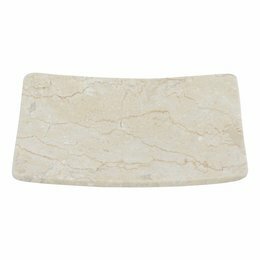 A beautiful, large, thin and elegant place to put your hand soap on that is an appropriate description for this soap dish made of cream marble. 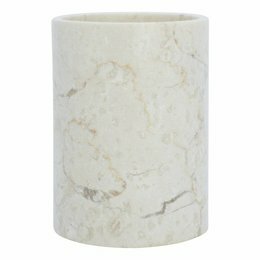 Marble toothbrush cups are timeless, elegant and durable and you also have a luxurious solution for loose lying toothbrushes. Height is 11 and diameter 8 cm. 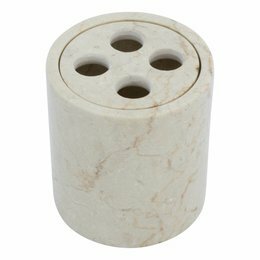 Toothbrush holder made of cream colored marble for 4 toothbrushes from our Madiun Set. The height is 11 cm and the diameter is 9.5 cm. 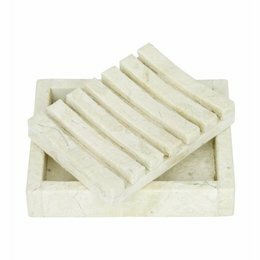 Soap dish with slanted edge made of marble from our Rangga set. A nice place for the hand soap in your kitchen, bathroom or toilet. 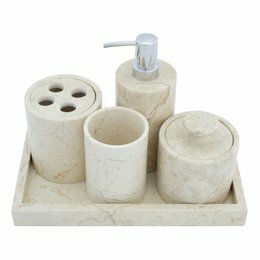 This 5-piece bathroom accessory set Savoe consists of a soap dispenser, soap dish, jewellery box, toothbrush cup and a toilet brush holder.